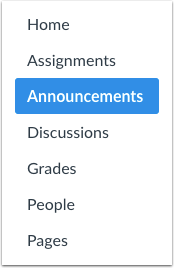 If you allow students to like announcements, you can like announcement replies in your course. To view the Like icon on announcements, you must allow users to like replies in a course announcement. The Like icon will be highlighted, indicating you have liked the reply. When a reply is liked, the Like icon will also display the total number of likes for all users in the announcement. Previous Topic:How do I allow students to like replies in a course announcement? Next Topic:How do I use the Assignments Index Page? Table of Contents > Announcements > How do I like a reply in a course announcement as an instructor?